Mario Lemieux spoke those words after watching a tearful Wayne Gretzky accept the 1989 Hart Trophy, his ninth league MVP. Lemieux, the 1988 Hart winner, had dominated Gretzky in the scoring race and had led his Pittsburgh Penguins to a franchise-best 40 wins and their first playoff appearance in six seasons. It wasn't enough. Lemieux finished a distant second in the Hart voting, receiving just 18 of the 63 first-place votes. He was left off two ballots entirely. The 1989 Hart Trophy is a travesty. It's not a travesty because Lemieux got robbed or because Gretzky added a fraudulent award to his legendary resume. It's not a travesty because voters made a mockery of the process and denigrated the sport. It's a travesty because this one foolish, illogical moment diminished a historic confrontation and helped perpetuate a fallacy that continues to this day. The NHL has a proud tradition of tarnishing the Hart Trophy and its other post-season awards through Canadian jingoism, blatant favoritism, and downright stupidity. In 1954, Chicago goaltender Al Rollins won the Hart for posting a 12-47-7 record with the lowly Blackhawks. One year later, in 1955, Teeder Kennedy won the Hart as a glorified career achievement award while scoring a whopping 10 goals for a mediocre 24-24-22 Toronto squad. Mark Messier claimed the 1990 Hart Trophy thanks to 10 western hockey writers banding together and leaving Ray Bourque off their ballots. Had just three of those pitiful protesters tossed Bourque a third-place vote, the Boston Bruins would have two Hart-winning defensemen. While hardly unique, the 1989 Hart debacle stands alone, its colossal significance becoming more apparent each passing year as scoring plummets and the game's beauty erodes beneath suffocating defensive structures and swollen goaltending equipment. But there was a time when hockey was about speed, skill, and creativity, a time when teams actually tried to score goals, not devise excruciatingly dull ways to prevent them. Gretzky had dominated the post-expansion NHL of the early 1980s. Playing on a stacked Edmonton team in six of the seven highest-scoring seasons in NHL history, Gretzky shredded the record book, posting four 200-point seasons, seven Art Ross Trophies, and eight Harts between 1980 and 1987. He made a mockery of the annual scoring race, winning the final five of those seven titles by an average of 74.6 points. Until Gretzky, no one had ever won the Art Ross by more than 26 points (Esposito, 1973). On four occasions during that stretch, Gretzky had as many or more assists than the next-highest scorer had points. Yes, Wayne Gretzky was in a universe all his own, a living, breathing hockey deity without peer. And then the 1987 Canada Cup happened. It wasn't Lemieux terrorizing the Russians. It wasn't Lemieux scoring those goals. No, it was Gretzky's greatness willing those pucks into the net. Such blind idolatry at Lemieux's expense would become a recurring theme. The Canada Cup set the stage for an epic 1987-88 season. Could the upstart Lemieux, still the solitary star in Pittsburgh's skyline, topple the great Gretzky? The enormous talent gap between their respective supporting casts narrowed when Edmonton traded Paul Coffey to Pittsburgh at the end of November, giving Lemieux his first superstar teammate and removing one of the many weapons in Gretzky's arsenal. After the first month of the season, Gretzky and Lemieux were tied with 26 points, Lemieux boasting 13 goals to Gretzky's seven. But by the end of December, Gretzky had opened up a 14-point lead, posting 30 goals and 86 points in 38 games compared to Lemieux's 31 goals and 72 points in 34. That's when disaster struck. Gretzky injured his knee and missed all but two games in January. Lemieux seized the opportunity, registering 17 goals and 35 points in 16 January contests. Gretzky returned to the ice in February and finished the season with nine goals and 56 points over his final 24 games, but there would be no catching Lemieux, who put up 22 goals and 61 points over his final 27. Lemieux had outscored Gretzky 168 to 142, snapping Gretzky's string of seven consecutive Art Ross Trophies and eight consecutive Harts. But the knee injury marred the outcome. While Lemieux had the decisive edge in goals per game (0.91 to 0.63), Gretzky had averaged more points per game (2.33 to 2.18), and the Great One's supporters could always point to the knee injury as the sole reason he surrendered the crown. Lemieux may have won the battle, but the fight was far from over. The Gretzky-Lemieux rivalry got even more interesting in the summer of 1988 when Edmonton traded Gretzky to the Los Angeles Kings. For the first time in their careers, Gretzky and Lemieux would be on similar teams. Lemieux still had Coffey, but Gretzky had two proven goal-scorers up front in Bernie Nicholls and a young Luc Robitaille. The supporting casts were essentially a wash. A 23-year-old Lemieux would take on a 27-year-old Gretzky under the same league conditions with comparable teammates. May the best man win. Gretzky came out flying with his new club, scoring 10 goals and 24 points in his first 11 games. Lemieux answered with 16 goals and 38 points over the same span. Gretzky managed to gain some ground in November due to Lemieux playing through a bruised sternum and a sprained wrist, but Lemieux went for 19 goals and 43 points in December to remove all doubt. On January 1, Lemieux had 43 goals and 104 points in 36 games to Gretzky's 29 goals and 86 points in 38. And that's as close as Gretzky would get. Lemieux never relented, finishing the season with a staggering 85 goals and 199 points in 76 contests. Gretzky ended with 54 goals and 168 points in 78 games, marking the first and only time in NHL history two players recorded more than 160 points in the same season. Again, the two had competed under the same league conditions and on comparable teams, and Lemieux defeated Gretzky by 31 points, all goals. Lemieux didn't just beat Gretzky, he destroyed him. He Gretzky'd Gretzky. The two heavyweights went toe to toe, and one got knocked the (sunshine) out. Lemieux was better. And he proved it. The big loser in the Gretzky-Lemieux showdown was Steve Yzerman. While the two hockey gods traded thunderbolts, the 23-year-old Detroit captain authored his own masterpiece, scoring 65 goals and 155 points in leading the Red Wings to the Norris Division title. In a world without Gretzky and Lemieux, Yzerman's 1988-89 campaign could very well be the greatest season in NHL history. He actually beat Lemieux in two statistical categories, shots (388 to 313) and even-strength goals (45 to 41), and his 155 points remains the most ever scored by someone not named Gretzky or Lemieux. Yzerman's presence made the Hart a three-horse race, but he was clearly the third horse. In 1988-89, there were 21 teams in the NHL, and three awards ballots went to each city's members of the Professional Hockey Writers' Association. The 63 voters named their top three choices for each award, with a first-place vote being worth five points, a second-place vote being worth three points, and a third-place vote worth one point. Gretzky won the Hart with 267 points, receiving 40 of the 63 first-place votes and lapping Lemieux by 80 points. Which is more disturbing, Lemieux getting only 18 first-place votes or his receiving 16 third-place votes? Sixteen grown adults, presumably licensed to operate a motor vehicle and permitted by law to live alone without supervision, felt 85 goals and 199 points warranted a third-place vote. Two others didn't even bother to include Lemieux on their ballots. Two similarly misguided souls completely ignored Yzerman, which is criminal in its own right. Curious as to the reasoning behind Gretzky's lopsided victory, I attempted to contact as many of the voters as possible. Sadly, several voters have passed away in the subsequent 26 years. And perhaps almost as sad, many other voters want nothing to do with me. But I did manage to track down more than 30 potential voters. Shockingly, most of the writers can't even remember how they voted. Sure, 26 years is a long time, but this is Gretzky and Lemieux! Hockey writers must have partied pretty, pretty hard back in the 1980s. Then again, perhaps this indicates people at the time didn't truly appreciate the historical significance of what they were witnessing. Or perhaps some folks were just reluctant to admit voting for Gretzky. Tim Campbell (Winnipeg), Eric Duhatschek (Calgary), and Dave Molinari (Pittsburgh) went on record as voting for Lemieux, and Tom McMillan (Pittsburgh) was another confirmed Lemieux vote. No one remembered voting for Yzerman, although I did confirm Keith Gave (Detroit) cast his ballot for the Red Wings captain. Only two of the voters I corresponded with, Rick Sadowski (Los Angeles) and Barry Meisel (New York), could recall voting for Gretzky, and I also found evidence Al Morganti (Philadelphia) was a Gretzky vote. "Having covered the Kings before Gretzky's arrival, I know first-hand the impact he had on the team that season. He basically turned a bad/mediocre team with a history of losing into a playoff team and Stanley Cup contender. He gave the Kings the kind of impact and status around the NHL and in Los Angeles that they'd never had. Mario Lemieux and Gretzky had the kind of seasons that will never be matched, Lemieux with 85 goals and 114 assists, Gretzky with 54 goals and 114 assists. No doubt both made their respective teammates and teams better. The Penguins went from 81 points the previous season to 87, the Kings from 68 to 91. With so few writers being able to remember how they voted, I conducted a literature review, examining hockey publications from the 1988-89 season. While Yzerman managed to keep Detroit atop the Norris, the Wings were 34-34-12, and they actually fell 13 points in the standings from the previous season. Yzerman also had the easiest schedule in the league, playing 32 games against the laughable Norris competition. Chicago, Minnesota, St. Louis, and Toronto had a combined record of 115-159-46. Gave proclaimed Yzerman accounted for 49.5 percent of Detroit's offense, which is great and all, until one realizes Lemieux accounted for 57.3 percent of Pittsburgh's offense. Gave contends Yzerman should be given credit for producing more on the road than at home, noting he had 80 of his 155 points away from Joe Louis Arena. Again, certainly commendable, but Lemieux put up 94 road points. Gave argues Yzerman's linemates, Gerard Gallant and Paul MacLean, tanked down the stretch, hindering their center's production. Not sure that's the best argument to make when defending a potential MVP who is supposed to make everyone around him better. Gretzky elevated Bernie Nicholls into a 70-goal scorer, and Lemieux made Rob Brown into a 49-goal, 115-point man. Slumping wingers or not, Yzerman managed just five goals over his final 14 games, and the Wings went on a 5-8-1 slide into the playoffs. And claiming to have a worse supporting cast than the 1988-89 Penguins is always a losing effort. Lemieux's linemates were Bob Errey and Brown. Errey had never scored more than 16 goals or 34 points, and Brown was a second-year pro who became a minor-leaguer within two years of leaving Lemieux's side. Meanwhile, Gallant had been a two-time 30-goal scorer, and MacLean had three 40-goal seasons to his credit. Detroit also had a yet unheralded Adam Oates who chipped in 62 assists and 78 points in 69 games. Yzerman at least got a consolation prize, as he won the Lester B. Pearson, adding another confounding footnote to a bizarre awards season. Lemieux had won the Pearson two of the previous three years, and Gretzky had won it five times, so I can only surmise the players wanted to spread the wealth and honor a season that fell short of the Art Ross and seemed unlikely to get Hart consideration. "There was no rebuilding program, no big plan. The perennial laughable Kings simply slipped no. 99 into a new black, white and silver jersey and on Opening Night they were Great. Meisel conceded the obvious, admitting he voted Lemieux as the First-Team All-Star Center in acknowledgement of Lemieux being the better player, but he didn't view that as equating to Lemieux being more valuable. And he wasn't alone in making this distinction, as Lemieux did receive First-Team All-Star honors. And that right there is the key point in all this. During the 1980s, the Hart always went to the best player. That's why Gretzky won it every year from 1980 to 1987; he was undoubtedly the best player. Gretzky was in no way the "most valuable" player those eight seasons. Gretzky could have taken entire years off, and Mark Messier, Jari Kurri, Paul Coffey, Glenn Anderson, and Grant Fuhr would have still made the Oilers Stanley Cup contenders. This would be proven one year later in 1990 when the Oilers won the Cup without Gretzky. I'm sure Dale Hawerchuk would have appreciated this whole "most valuable" argument in 1985 when he scored 53 goals and 130 points in leading the Jets to a 43-27-10 record and second place in the Smythe, just six wins shy of the mighty Oilers. Yet Hawerchuk received one first-place Hart vote to Gretzky's 60. Mike Bossy, Marcel Dionne, Peter Stastny, and Denis Savard all would have benefitted greatly from this "value" interpretation. 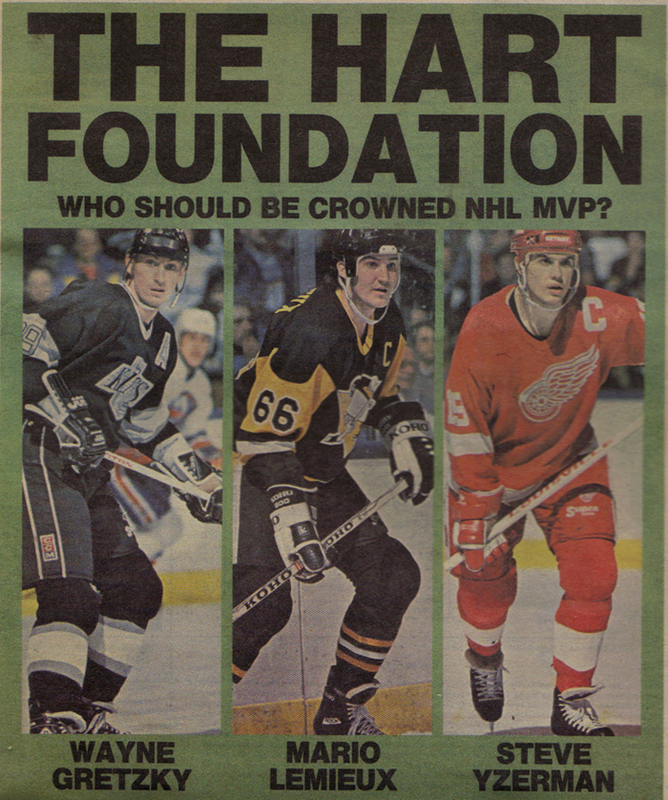 But from 1982 through 1987, Gretzky received 329 of 365 (90.1%) first-place Hart votes. Such an argument was never even considered until it became apparent Gretzky was no longer the best player. And then, well, the rules had to change. As McMillan points out, if transforming a team overnight is the definition of value, then why didn't Lemieux win the Hart in 1985? 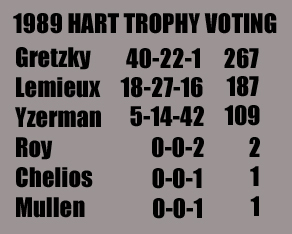 Lemieux didn't receive a single Hart vote in 1985, not even a third-place gift. The Hart always went to the best player, not the "most valuable." When Lemieux won the Hart in 1988, the Penguins missed the playoffs. They could have missed the playoffs without him. He won because he was the best player. In 1988-89, Lemieux was the NHL's best player and its most valuable. That in no way diminishes what Gretzky did for Los Angeles. While the Kings had made the playoffs the previous two seasons before his arrival, they did so with losing records and quickly bowed out in the first round. With Gretzky in the lineup, the Kings won 12 more games and improved 23 points in the standings, finishing fourth overall in the NHL. But he didn't do it alone. Los Angeles overhauled its roster for the 1988-89 season. Gretzky was the most prominent addition but hardly the only one of significance. Ten of the Kings' top 20 scorers weren't even on the roster in 1987-88. Newcomers like John Tonelli, Mike Krushelnyski, and Marty McSorley brought Stanley Cup championship experience, helping Gretzky change the culture, and guys like Doug Crossman, Tim Watters, Dale DeGray, and Jay Miller bolstered the blue line. However, the biggest difference may have been in goal. In 1987-88, Glenn Healy and Rollie Melanson backstopped the team to a 4.37 goals-against average and an .863 save percentage. In 1988-89, Mark Fitzpatrick and Kelly Hrudey entered the picture, helping lower the team's goals-against to 4.02 and producing an .880 save percentage. Hrudey was the true difference maker. Before Hrudey arrived from the Islanders, the Kings were 32-27-4, earning 68 of 126 (54.0%) possible points. With Hrudey between the pipes, the Kings went 10-4-2, capturing 22 of 32 points (68.8%), and he posted a 2.90 goals-against and a .904 save percentage. Now that is a valuable player. Coaching also played a role in the Kings' turnaround. Robbie Ftorek took over as coach midway through the 1987-88 season and guided the club to a 23-25-4 record, righting the ship after a horrendous 7-17-4 start under Mike Murphy and GM Rogie Vachon, who had stepped in as interim coach for one game. Had Ftorek been behind the bench for the entire 1987-88 season, the Kings would have been a .500 team, and there wouldn't have been a 23-point improvement in the standings the following year. Despite the impressive regular season in 1988-89 and a first-round playoff victory against the Oilers, Ftorek got fired over the summer, largely due to a personal conflict with Gretzky. The relationship soured during a November 23 game in Detroit. Gretzky, on his way to a six-point night in an 8-3 laugher against the Wings, smashed his stick over the net in response to a second-period Yzerman goal. During the intermission, Ftorek announced he would be benching Gretzky at the start of the third to teach the team discipline. Gretzky told Ftorek, "Robbie, if you want to teach, go back to New Haven. We're here to win the Stanley Cup. "12 Gretzky sat out the first eight minutes of the third, and Ftorek was unemployed come May. Lemieux faced his own coaching challenges. In 1988-89, Lemieux and the Penguins skated for Gene Ubriaco, their third coach in three years and a man who used to crawl on his hands and knees through a trapdoor to reach the bench rather than walk across the ice and face the home crowd's derision. Pierre Creamer, the coach in 1987-88, will always be remembered for being so inept he didn't understand the Penguins needed to beat the Washington Capitals in the 79th game of the season to keep their playoff hopes alive. With the two clubs tied 6-6 in overtime, and the clock running out on not only the game but their season, Penguins players pleaded with Creamer to pull the goalie. Creamer refused, stubbornly insisting the Pens only needed a tie. This led to Lemieux having a heated argument with Creamer in French, culminating with Lemieux hopping over the boards and scoring the game-winner with a miraculous individual rush that featured him annihilating Larry Murphy and then swatting the puck behind Clint Malarchuk while being tripped to the ice. It was Lemieux's fourth goal of the game. The incident symbolized Lemieux's early days in Pittsburgh, a genius suffering amidst a confederacy of dunces. Lemieux's 1989 Hart case is self-evident. He led the league in goals (85), assists (114), points (199), power-play goals (31), shorthanded goals (13), and hat tricks (9). He also finished a plus-41 on a team that allowed two more goals (349) than it scored. Dan Quinn, the team's second-line center, was a minus-37. Brown and Errey, Lemieux's linemates, were the only other forwards without a minus rating. When Lemieux wasn't on the ice, the Penguins were losing. Badly. While the Penguins may have improved by only six points from the previous season, that improvement represented a quantum leap for the franchise. Missing the playoffs back in the 1980s wasn't easy, yet the Penguins had managed to do it six straight seasons. In 1987-88, they notched 81 points but finished last in the loaded Patrick, just seven points behind the first-place Islanders. Lemieux wasn't about to let that happen in 1989. With his team mired in a late-season swoon, Lemieux scored 19 goals and 27 points over the final 10 games to carry the Penguins into the postseason on a winning note. Gretzky winning the Hart in 1989 denied Lemieux his rightful legacy. Instead of a coronation, a triumphant celebration of his personal victory over Gretzky, Lemieux suffered what remains the worst ignominy of his career. To this day, Gretzky is hailed as the greatest hockey player ever, a reputation built on inflated post-expansion statistics compiled when Lemieux was either not in the league or a teenager on a dreadful team. Lemieux's back injury and eventual surgery would ruin his 1989-90 and 1990-91 regular seasons, and his battle with cancer would limit him in 1992-93 and ultimately cost him the 1993-94 campaign and the lockout-shortened 1995 season. Despite the poor health, Lemieux would go on to win four more scoring titles (1992, 1993, 1996, 1997). Gretzky would add three more of his own, but they all came in seasons when Lemieux wasn't healthy enough to play 60 games (1990, 1991, 1994). From the 1987 Canada Cup on, Gretzky never beat a healthy Lemieux for a scoring title. Even though their careers overlapped, Gretzky and Lemieux seldom skated on equal terms. Age and supporting casts tipped the scales most seasons, first in Gretzky's favor and then in Lemieux's during Pittsburgh's Cup years. Gretzky's knee injury tainted 1988, and Lemieux's health woes prevented duels in 1990, 1991, and 1994. But we'll always have 1988-89, a year when the two greatest scorers in NHL history battled for hockey supremacy at the height of their powers, slugging it out with two unimaginable offensive seasons. One man won. And the other man got credit. Big thanks to everyone who helped out with the research, particularly Rick Sadowski, Barry Meisel, Lance Hornby, Eric Duhatschek, and Wayne Fish. 1. Scott Morrison, "Hartless Lemieux Less Than Kind," Toronto Sun, June 8, 1989. 2. Phil Coffey, "Gretzky Vs. Lemieux -- Another Opinion," Superstar Hockey Yearbook 5, no. 1 (1989): 9. 3. Rick Sadowski, e-mail with author, February 25, 2015. 4. Keith Gave, "The Case for Yzerman," The Hockey News 42, no. 34 (1989): 7-8. 5. 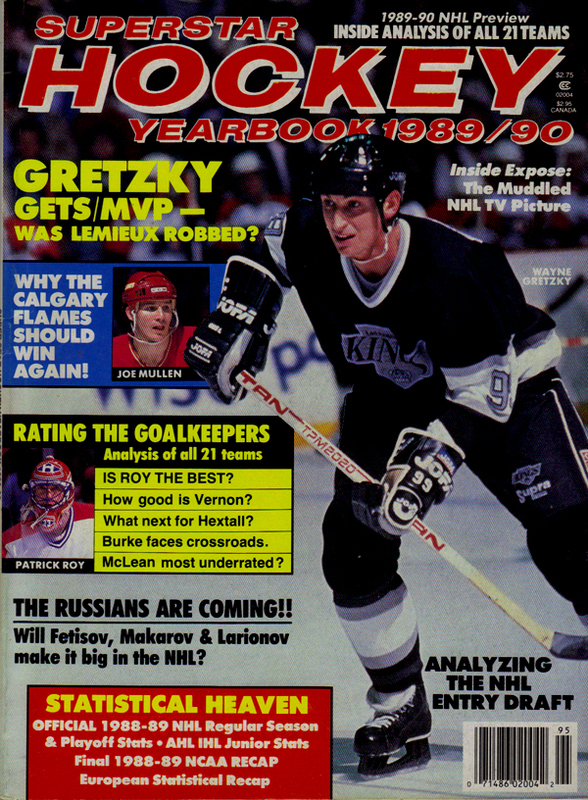 Barry Meisel, "The Case for Gretzky," The Hockey News 42, no. 34 (1989): 7-8. 6. 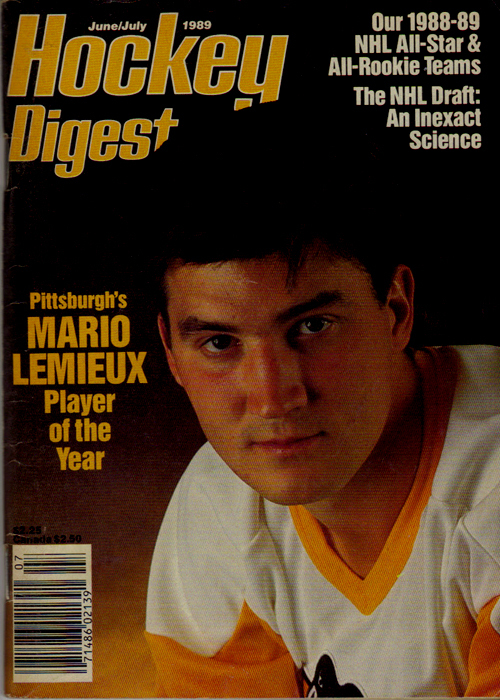 Bob Grove, "Mario Lemieux: Player of the Year," Hockey Digest 17, no. 8 (1989): 17. 7. 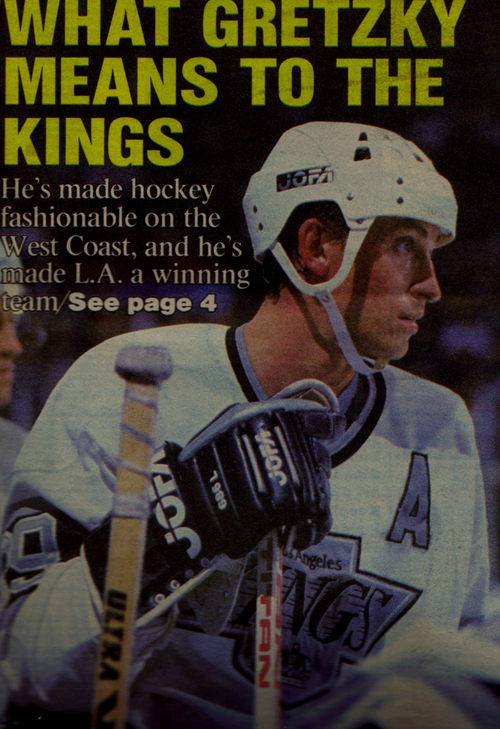 Larry Wigge, "Shaking Out the Gretzky Deal," Sporting News 207, no. 6 (1989): 4. 8. Hockey Database, "Los Angeles Kings Yearly Attendance Graph," http://www.hockeydb.com/nhl-attendance/att_graph.php?tmi=6664 (accessed June 21, 2015). 9. Hockey Database, "Pittsburgh Penguins Yearly Attendance Graph," http://www.hockeydb.com/nhl-attendance/att_graph.php?tmi=7475 (accessed June 21, 2015). 10. Barry Meisel, phone conversation with author, May 8, 2015. 11. Tom McMillan, "The Case for Lemieux," The Hockey News 42, no. 34 (1989): 7-8. 12. Tracy Dodds, "Kings' Success Doesn't Save Ftorek's Job: With Lack of Players' Support, Controversial Coach Is Fired," Los Angeles Times, May 3, 1989, http://articles.latimes.com/1989-05-03/sports/sp-2544_1_coach-robbie-ftorek-kings-record-kings-american-hockey-league (accessed June 21, 2015). 13. Lance Hornby, e-mail with author, January 23, 2015.